Who doesn’t love crepes? You can literally eat them for breakfast, lunch, or dinner and stuff them with whatever your little heart desires. 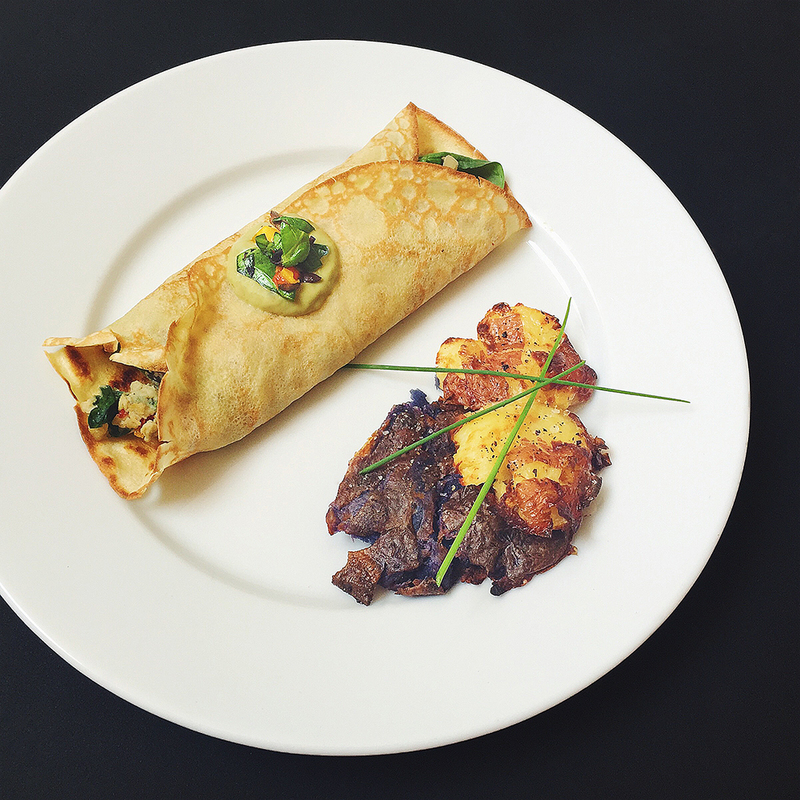 This is our take on a savory crepe, however you can literally add whatever you want in between this thin pancake. Think of it as a breakfast burrito, a lunch wrap, or a dinner concoction! We added a side of smashed potatoes, which are so easy and a great french fry alternative. Let us know what you stuff into your crepes, we would love to hear from you! Toss the mini peppers in olive oil, salt and pepper. Place on a greased baking rack or aluminum foil and bake for 15-20 minutes, turning halfway in between. While the peppers are roasting, sauté the shallot and mushrooms in a medium, lightly oiled sauté pan over medium heat for 4-5 minutes, under tender. When the mushrooms are finished, set aside in a small dish. When the peppers are finished roasting and have cooled, cut them into slices and add to the mushrooms. In a large mixing bowl add the eggs and milk and whisk together. Add the veggies, cheese, salt and pepper and continue whisking until everything is completely mixed. Poor the egg mixture into a large skillet set to medium-low heat. Scramble the eggs by scrapping the bottom of the pan while the eggs cook until they are fluffy and no longer runny. In a blender, combine the avocado, lemon juice and water. Blend until smooth. Add a little olive oil and a time and continue to blend until the correct consistency. Salt and pepper to taste. 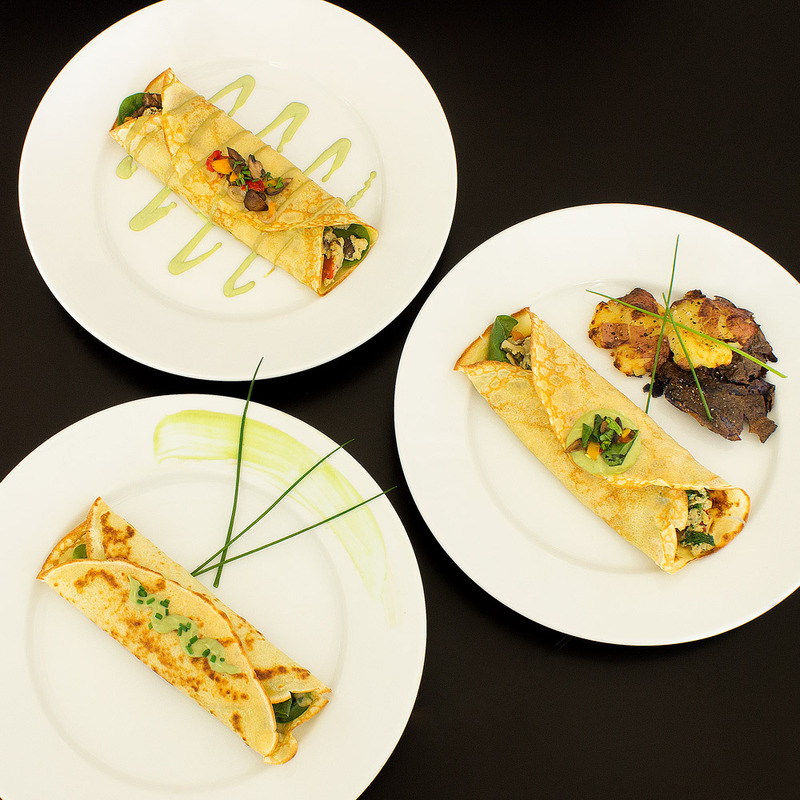 Fill the crepes with the egg mixture and top with the avocado hollandaise and serve immediately.